Eschenbach 1521-22 easyPOCKET Illuminated Magnifier. 4x Magnification. SMD LED Lighting. Are you looking for a small, illuminated magnifier you can use in restaurants and other dimly lit locations? If so, the new easyPOCKET is perfect! Now available in 4x magnification, the easyPOCKET features a unique 50x46mm aspheric / diffractive hybrid lens that is distortion-free and only 3 mm thick! Bright illumination is provided by new SMD LED lighting that never needs to be changed. Plus, with a built-in automatic contact mechanism, the light conveniently goes on and off without a switch! The easyPOCKET is protected by a strong fiberglass reinforced plastic case that minimizes lens scratching. The new 4x is available in an elegant, metallic blue case. For added appeal, the easyPOCKET is packaged in a unique box that slides open when the tab on the right side of the box is pulled, the easyPOCKET slides out of the left side! 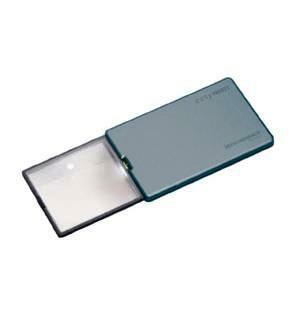 Eschenbach 1521-10 easyPOCKET Illuminated Magnifier. 3x Magnification. SMD LED Lighting. Black Case. Eschenbach 1521-11 easyPOCKET Illuminated Magnifier. 3x Magnification. SMD LED Lighting. Silver Case.